Personal Note – June 2009 E.V. I picked up this book at my local library from the "new books" shelf, even though the book has been in print for about 2 years. The title caught me, then the splashy black and red portrait of Jimmy Page on the front cover. The quote from Liber Legis at the beginning of the first chapter clinched it. I had to at least skim this huge tome to see if there were any new glimpses into the magickal side of Page's life. I wasn't disappointed. It was a pleasant surprise to find a lot of interesting tidbits about Crowley inevitably interwoven with Page's part of this biography, as well as insights into the musician's connection with the film-maker Kenneth Anger. Within the context of the rest of the book, which as a whole chronicles the musical careers of all the band members along with their often demented and animal "rock star" behaviour, Page's penchant for the mystical and magickal seems lucid and sane in comparison. Chapter Nine, entitled "So Mote it Be" (28 pages) is devoted to Jimmy Page's interest in the works of Aleister Crowley. In the middle of the chapter, by coincidence or design, there's a section of photos which include a self-portrait of Crowley and a photo of himself posing in ritual garb. On the opposite page is a color photo of Boleskine House, which Page once owned and set out to restore to the way it was when Crowley lived there. To open the chapter, the author points out, after citing a section featuring a demonic invocation from the widely read novel from the late sixties 'Black Easter' by James Blish, that these rituals are not fantasy, but do indeed exist worldwide and "the people involved are not simple peasants or social outcasts but some of the brightest, most questioning minds most often drawn from the upper echelons of society." 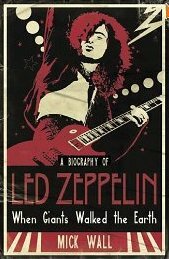 He goes on to cite the essence of the Abra-Melin ritual - to "Invoke Often" - and this is a theme-song, if you will, that accompanies Jimmy Page through the rest of the book. In quotes from various interviews over the years, he constantly (and rather mysteriously) speaks of "invoking" with reference to his music-making. Several paragraphs in chapter nine are spent debunking many of the typical misconceptions about Aleister Crowley. He was not a satanist. He did not practice black magic. The author takes it upon himself to touch on the history of the O.T.O., the definition of magick, and even the universal "element of fertility" before launching into an extensive and fairly well-written biography of Crowley himself. This leads into the topic of how Crowley's influence lives on today, not only in rock music but the arts in general, notably cinema. The stage is set for the entrance of Jimmy Page, beginning in the early days of Led Zeppelin, when he became wealthy enough to start collecting Crowleyana, including diaries, first-edition manuscripts, and possessions such as canes, paintings, robes, anything he could find. He purchased Boleskine House, where he installed much of his priceless collection. Eventually he sold the house, which has since been remodeled and some of the original structure demolished. In a more recent interview, Page laments the loss and ponders the possibility of reclaiming Boleskine House to make it into a kind of museum. Other chapters maintain Page's ongoing connections with Crowley. He acquired a bookshop in London, named Equinox, mainly so he could get the books he wanted. Crowley's horoscope was displayed on the wall of the shop. The bookshop historically published a "perfect facsimile" of 'The Book of the Goetia of Solomon the King' (Crowley's interpretation of the Lesser Key of Solomon). In interviews, Page is consistently vague about his occult involvements. Mick Wall attributes this to the fourth part of the Magician's vow "to know, to dare, to will, to keep silent". This book may reveal as much as we'll ever know about his magickal life, for those who are interested.